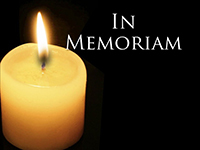 (Austin, Texas - Sunday, September 20, 2015) - On Thursday, September 17, longtime racehorse trainer P. J. Oliver passed away. A funeral service for her will be held at 10:30 a.m. on Saturday, September 26 at the St. Thomas Episcopal Church in San Antonio. The family would like to invite P. J. 's racing friends to attend.